Solar Power is way of collecting, monetizing, and using the Energy from the sun. Thin wafers of semi-conductor material, usually silicon, are laid out in a grid that are then sandwiched inside the protective glass and frame of each Photovoltaic aka Solar Panel. When the sun’s rays hit the silicon, electrons are excited and freed. Every PV panels has a grid of positive and negative metal wiring to collect the electrons as they are released from the silicon. As the electrons are collected the move down the positive and negative wiring in a current. Viola! A current of electrons is Electricity. The suns electron are in what is called Direct Current, while a home or business runs on Alternating Current. The Inverter is the piece of equipment that changes the DC current from the sun to AC current. Without being evasive, the price of a solar system will vary on how much energy you need to produce. Some homes have systems that have 16 solar panels, while others have over 100 panels. What we do at Hot Purple Energy is size the system based on energy needs, aesthetics, solar exposure, budget, and the desired rate of return. We like to design systems that have a 6-7 year conservative payback of the cash price, minus the 305 Federal Investor Tax Credit. 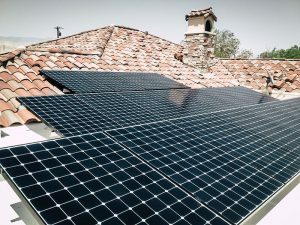 The Federal Tax Credit for residential roof top solar allows you to deduct 30% of the Solar System’s Cost from your personal Federal Tax Liability. If the tax credit exceeds your liability in the year of the systems purchase, the tax credit can be used in subsequent years out the credits expiration on December 31, 2019. Please refer to IRS Form 5695 for details on this credit and review your personal relevance with a tax professional. How much will I really save on my utility bills from a home electric solar power system? The amount of savings is based on a few factors: available roof space, budget, and your electric use. We have designed systems that produce 100% of a client’s power, as well as 50%. Southern California Edison customers generally benefit better by not going to 100% electric production based on the low tier 1 billing. But it’s a case by case answer. Electricity from solar is less expensive that grid power, the question is by how much per client and billing rates. We will review all of the parameters that effect what you can produce and what you want to produce. What’s the difference between solar photovoltaic and solar hot water systems? Solar Photovoltaic (PV) produces electricity – Solar Hot Water system run either water or glycol to the roof for heating water. While HPE does have some hot water options, we are strong advocates for Solar Electric. We are happy to discuss the options for both. How much maintenance do solar energy panels require? A rooftop solar system has no moving parts and requires very little maintenance. Cleaning the panels is the primary care item. While some areas of the CV have more dust than others, the cost for cleaning is minimal compared to the savings. We offer 2 free cleanings in year one, which allows us to determine how often the panels need to be cleaned. Rain does a good job, when we have it, but having us professionally clean them a couple of times per year helps tremendously with keeping the production up. While paying cash reaps the greatest financial return, there is plenty of room to add an interest component and still save considerably on your annual electric bills. There are many finance option including zero down Property Assessed Clean Energy Loans (PACE). We will review the finance options and how they affect your individual savings. For more information visit our Solar Finance article or inquire upon your review. A very popular vehicle for getting into solar these days is the solar lease. It’s a zero down option that allows a client to run their home on solar power while saving on their electric bill. Leases are for 20 years. You pay a monthly fee for your lease. This can be fixed or have a percentage increase over time. Ideally, the cost of your new solar reduced electric bill + your solar lease payment are less than your current grid electric bill, thus, savings from day one. At the end of 20 years you can: buy the system at the then market value, re-lease, or have the leasing company remove it at their cost. The plus is that there is zero to little money down, the negative is that you save significantly less than you do with a purchase, and you have a 20 year obligation that needs to be addressed if and when you go to sell the house. It should be noted that not all leases are the same. We sadly see many leases in the marketplace that claim to offer production guarantees while using very cheap solar panels and shoddy installation techniques and equipment. We already have seen these 20 year leases fall well short of their promises and solar itself will be blamed. Hot Purple Energy lease product utilizes best in class SunPower panels and our same quality installations and customer service. Do I need special insurance requirements? No. The system becomes a fixture of the structure. Yes. Hot Purple Energy handles the entire permitting process as well as HOA approvals if required. What should I ask a solar professional installer? One important thing to consider is who is doing the work on your house. 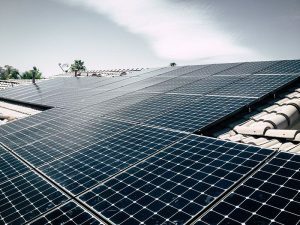 Many companies focus on the solar savings, and avoid the reality that “solar” involves roof penetrations, electrical wiring, conduit runs to your electric meter to name a few. HPE is a full GC and other than bringing in local professional roofers to handle the roofing work, we perform all the work ourselves. We guarantee our workmanship for 20 years and you will have met our construction manager, our super intendant and most likely the owner of the company in the process. In other words, we guarantee your piece of mind as well as your solar production. Also check local References and Referrals and Affiliations. There is a lot to consider when making a decision to get solar power. While we are confident in our value and workmanship, it helps to hear what’s available in the marketplace from numerous sources. Hot Purple Energy is a boutique company. We are not trying to be the biggest solar company, just the best. Other bids will add to your knowledge and with knowledge your decision to go with HPE will feel even better. Depending on how complicated the roof and system is the actual installation can range from 3 to 10 working days. Permitting can take a week or two. The Interconnection process with SCE takes about six weeks, so we plan our installation accordingly. Your account representative will review the details of our crew’s availability and will work to match your schedule at that time. What components do I need to install a grid-tiered solar electric system? The Photovoltaic Panels to collect the suns energy. The Stands and Rails to attach them to your roof. The Wiring and Conduit to run the DC power from your Panels to your Inverter. The Inverter, to convert the DC power from the Sun to the AC power for your house. The Conduit and wiring to the electric meter. The monitoring so you and HPE can see your production in real time. All of this is permitted and processed by the utility company as well. Net metering is the adjusted billing arrangement that you will be under once producing your own grid tied power. As your solar system can and will generate excess power during a day or even within a month, the power company credits you for this over production. Net metering is just that, the net of your annual production vs your annual consumption. You will still be given a monthly tally of your “bill” but as it may be a negative number one month and a positive the next they roll the credits until the end of the year. Your account representative will walk you through this as billing can be a complicated subject to track. Batteries are not a requirement. Because your meter goes backwards during the day, you are storing your excess energy in the form of credit on your meter, so in a way the grid is acting as a battery backup. But if you would like to have emergency power for your home in the event the grid goes down, or run off grid at night, batteries would be required. We have multiple storage options that work with or without solar. How much space do I need for a solar photovoltaic system? The space required really depends on how much energy you use. We also will consider aesthetics, and shading issues. A few hundred square feet is average but this is really a case by case number. How many solar panels do I need for an electric solar power system? Solar panels have various wattages and efficiencies. We remain an open platform company but in retrofit solar usually use the most efficient SunPower brand panels, meaning the smallest SF used on the roof to produce the most power. 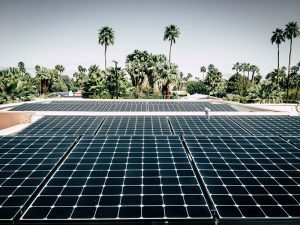 Your specific number of panels will be a result of your electric consumption, available area, and budget. Don’t cut your trees without replacing them! This can add heat load to your house to where you will require more solar. This is where a good green architect can help with modern electronics and good installation techniques. Some shading can be mitigated. How do I know if solar panels will work on my home? If you have energy efficient home and still have over $150 in electric costs per month, solar is a viable financial option. South, East, and West exposure works for solar with some shading being ok.